The Milky Way over southern New Hampshire. August 07. 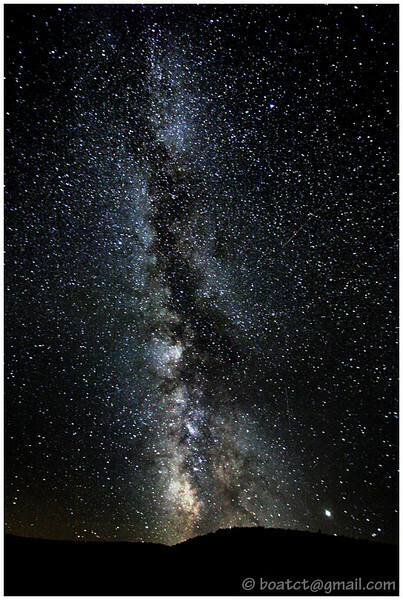 This is the most beautiful photo I have ever seen of the Milky Way, so clear. Fantastic photography. I live in Ireland and unfortunately we would never see the Milky Way like this.Thank you for sharing this with others. Excellent shot. I would really like to know how it was taken. Considering this would have to be a timed exposoure, I would be interested to know the lens, ISO, and exposure times to get this so vividly clear with no start streaks..? Wow! I'm a big fan of yours and this is something even different from what I normally see of yours - and you do this great too. Cool image. Never get tired of star gazing. It is just so phenomenal how many there are in the sky and how many we just do not see in our cities. Beautiful!